Three children walk along an old viaduct and leaving their slum neighborhoods by using their imaginations. Dulcie is sad because she's always lived in England and can't share memories with the other two. 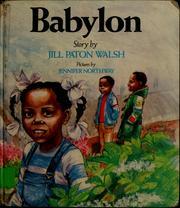 Walsh, J. P., “Babylon,” Children's Picture Book Database at Miami University, accessed April 22, 2019, https://dlp.lib.miamioh.edu/picturebook/items/show/9912.